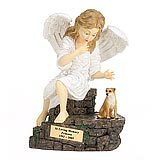 "I have received the memorial for Montana and it is as I expected. Beautiful. Montana, in our hearts was our child and treated as such. I wish to thank you for your compassion at the time when it was needed most." 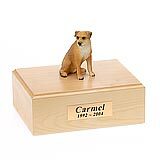 All available Border Terrier dog urns and memorials will be displayed with the figurine on the Border Terrier urn you select and in the appropriate size.